I love statistics and data. Do you? I love them even more because of Gapminder. 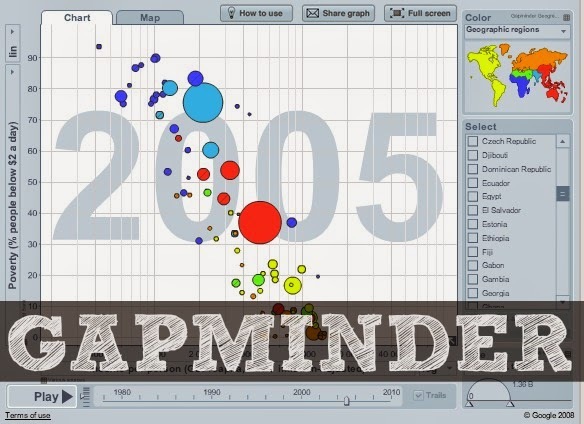 Gapminder takes statistics and data and visually graphs them over time, which can then be animated. Animate my stats, data, facts and figures? Yep, animate them. See that play button above (lower left hand corner of graphic)? Thanks to Hans Rosling, who has appeared on TED Talks over a handful of times (yes, that's how bright and creative this guy is), we can now "play" with our stats and data. Play! Do you know how awesome this is for kids and teens? How about us adults? Life and statistics just got totally better with Gapminder. PS - The graphic above depicts poverty statistics from around the world over time. I was so bummed to see how high Ethiopia is as I was thinking of all the kids at AHOPE and our Rainbow Loom Project. Ethiopia is one of the upper, medium-sized, royal blue circles. Boo.